I posted this about a month ago, but have been delayed in my efforts by The Renovation Of The Secret Underground Laboratory. A truly major project involving new overhead lighting, laminate flooring, built-in cabinetry and a paint job. It's been a month since I've been able to get any work done in there. At any rate, The Lab should be completed in the next few days, at which point this Ironman goes onto the stand. I'll strip it down to the bare frame, get some matching auto touchup paint and refinish the few minor scrapes and scratches, then rebuild with Phil grease and new comsumables as required, including white bar tape and Jagwire housing, Shimano stainless cables, Vittoria Rando 28's, a white Ritchey Streem saddle, and a kinda special rear wheel: new modern Shimano freehub laced to the original bronze Araya rim, with a 9 speed 12/27 cassette and 9 speed chain. I intend to use the existing Shimano 600 components (they are pre-SIS = friction) so it will look original until you peer at it closely. 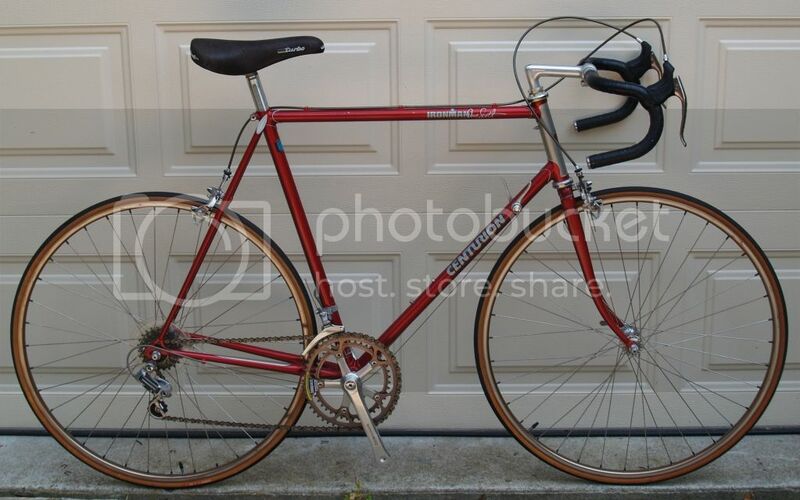 I think I'm going to need a shorter stem, too, but have a nice Cinelli in the box. Not sure how crisp the shifting will be (I've heard reports at both ends of the spectrum) or whether I'll have to replace the brake pads with Kool Stop Continentals, but should make for an interesting and entertaining foo-foo bike.